This article is about the quest. For the NPC, see Barenziah. Speak with the Queen for further matters of state. Speak with Tienius Delitian and be told to see Queen Barenziah. Speak with Queen Barenziah in her chambers opposite the Throne Room. Have an optional chat with Plitinius Mero about Morrowind lore and history. Speak with Fedris Hler in the Temple's Reception area for further quests. This quest is entirely optional. No entry appears in your Journal - you are being nudged towards the next quest-giver. Following the advice of Tienius Delitian after the last quest, speak with Queen Barenziah in her chambers opposite the Throne Room. She tells you to go and speak with Fedris Hler in the Temple and learn what you can from him. She also suggests you speak with Plitinius Mero in the Royal Palace Courtyard, who often has wisdom to dispense to those looking for it. Speak with Mero in the Royal Palace Courtyard to see what he has to say. He is the author of the widespread book, The Real Barenziah. The book caused a great stir; he was almost executed for it, before being saved by the Queen herself. 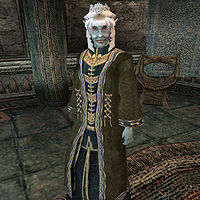 Plitinius Mero possesses a lot of knowledge and lore of the Empire and Morrowind which you might find interesting. Speak with Fedris Hler in the Temple's Reception area for further quests. Note that you may skip all of the initial quests for Tienius and speak directly with Fedris when you first arrive in Mournhold.